It's about time we talked about Crohn's Disease again. I don't mention it a lot on the blog since that is not the focus, but it certainly does have an effect on what I eat and drink. Medication is not the only important factor about managing this disease. Diet and lifestyle play a huge role as well. I will get into more detail later in the post, but the main reason for sharing this today is #24 on my list, Water Kefir. I decided several years ago that I was going to do all I could to managing my disease without a lot of medication. Any symptoms that I experience only fuel my drive to better manage my health through food, and gain as much knowledge about nutrition as I can. Because, ultimately, the healthier I am, the more I can enjoy food and life! I first discovered Water Kefir about a year ago at the Gluten & Allergen Free Expo. A booth under the name of GRUB was setup towards the back of the room and handing out samples of a sparkling drink. Curious, I tasted several of them and was initially hooked. 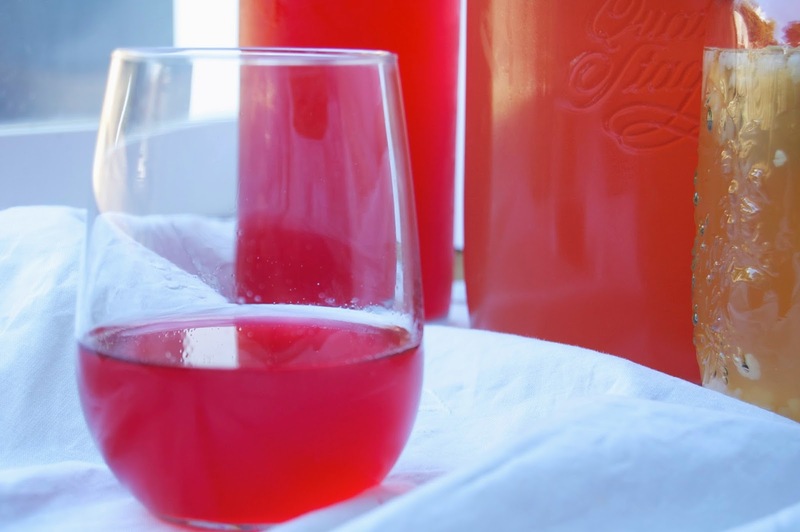 I struck up a conversation with the vendor and learned that the delightful drink I was enjoying was Water Kefir, a fizzy, probiotic soda that is easy to make at home. 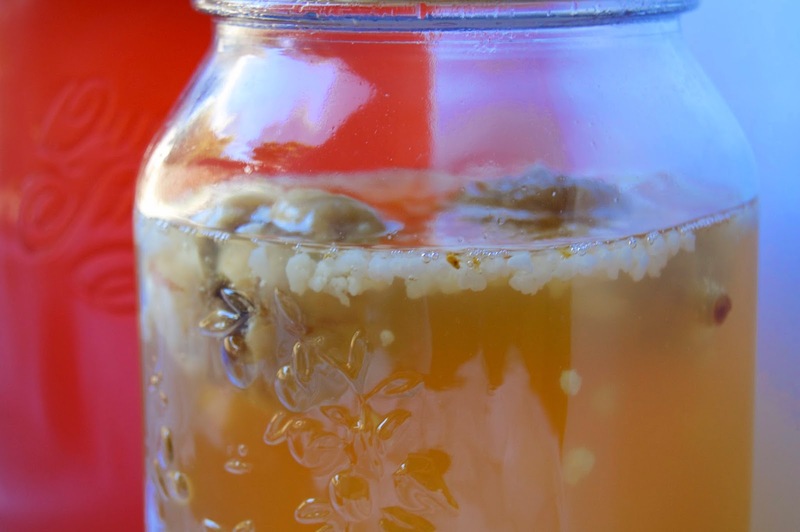 Water Kefir contains vitamins, minerals, amino acids and enzymes and has both antifungal and antibiotic properties. 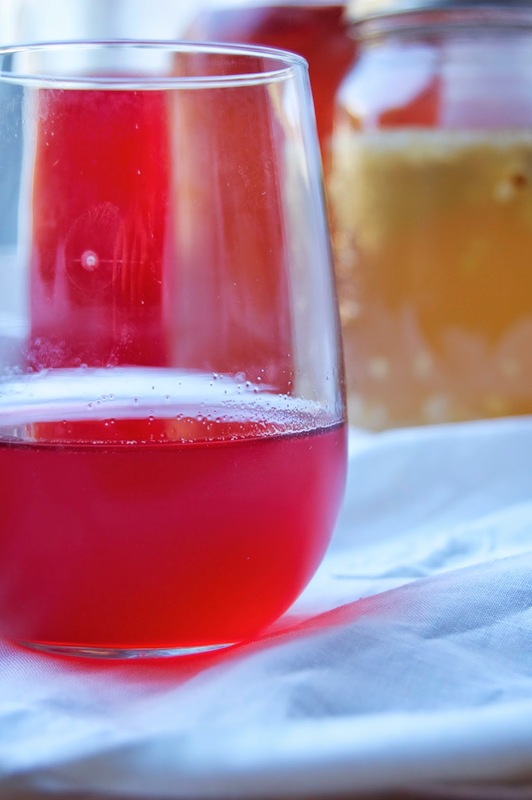 Although Water Kefir is made with organic cane sugar, active cultures and filtered water, the sugar content becomes very low once it is fermented. GRUB explained that many of their clients experienced improved digestion, clearer skin, increased overall immunity, and additional energy (just to name a few). I was sold! 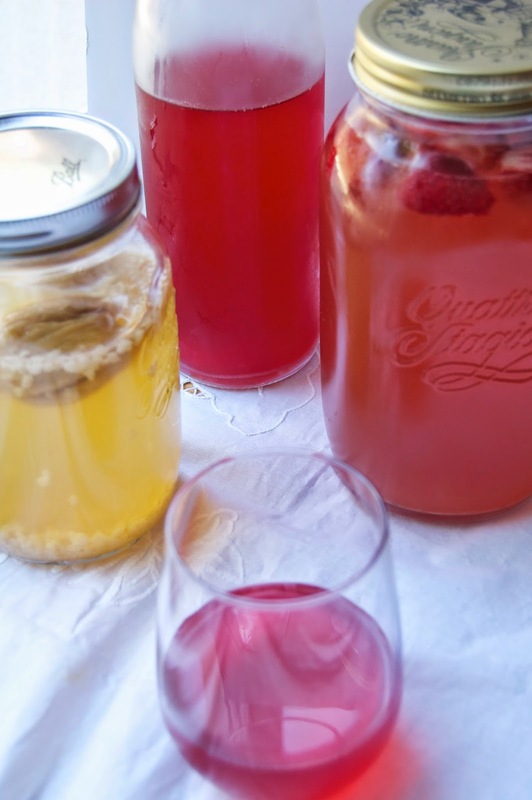 I purchased a Water Kefir kit and got to fermenting as soon as I was home! The cultures are the little white jelly things in the picture below. They dance around like little happy feet during the fermentation process. The best part is that they are reusable and very hard to kill. I've had the same cultures for the entire year and they have more than doubled, allowing me to share with friends! After a year of drinking Water Kefir everyday, I can vouch for its claims! This stuff is amazing AND delicious. The Hubby has even jumped on the probiotic drink train and likes to drink a glass with dinner every night. Crohn's Disease is a form of Inflammatory Bowel Disease (not to be confused with IBS). Along with Ulcerative Colitis, Crohn's causes chronic inflammation in the gastrointestinal (GI) tract, which can prevent certain GI organs to function properly. This in turn can interfere with digestion and the absorption of nutrients. There are several other aspects about the disease, but the most significant one is that there is no known cause or treatment for it. There are several therapies available to help manage the disease, including surgery. However, many IBD patients have turned to diet and lifestyle to help manage the disease, which is what I have found to be most helpful. Since all patients are different, I started with a food journal. The journal I keep details my food, drink, medication, exercise and bowel movements (I know, I know, but it is important). What started out as a project to help me figure out trigger foods, turned into a resource for my doctors and overall health. After two years of journaling, I discovered several things and tailored my diet and lifestyle to accommodate those learnings. Tune in tomorrow for a sweet and crunchy treat!